In the heart of the historic city centre this bed and breakfast Rome Italy has an envious location on a small side street just off of the trendy Via Veneto, and is within easy walking distance of all attractions, just perfect for sightseeing and taking evening walks where you will find a large selection of restaurants, bars and cafès right on your doorstep. This b&b in Rome boasts a walking distance of 5 minutes from the Spanish Steps and Trevi Fountain as well as the main Via Del Corso shopping street, but should you get tired of walking around the maze of charming cobbled stone streets the b&b has the metro stop ‘Barberini’ just 50 metres around the corner and from here you are 1 stop from the Spanish Steps, 2 stops from the central train station ‘Termini’ and a short ride away from the Vatican and museums. There is also the possibility of public buses running day and night which will connect you with all areas of the city should you prefer a more scenic route. The same ticket applies to both the metro and the buses in central Rome. Tickets can be purchased from most Tobacco shops, newspaper stands and from the self service machines located near some bus stops and in the metro stations. 1 ticket is at the rate of 1.00 euro and once stamped in the automatic machines or on the actual buses and in the metro stations is valid for 75 mins for 1 metro ride and unlimited bus use. For 4 euro you can purchase a ticket for 24 hours from the time of validation, for 3 days 11 euro and 7 days 16 euro. Please note that our bed and breakfast in rome italy is in an area of limited traffic from monday to friday 06:30 – 18:00 and Saturday 14:00 – 18:00 so we strongly suggest leaving your car outside this limited area – ideally at Porta Pinciana so that you may walk down Via Veneto to our centrally located b&b. Bed & Breakfast De Cappuccini could not be better located! The name of our highly popular b&b is derived from the famous church of the Capuchins located just across the road. This church is noted as one of the most visited in Rome due to it’s rather peculiar furnishings of friars bones which adorn the walls and decorations, but for those of you searching for more modern points of interest you can retreat to the nearby Hard Rock Cafe! From the main train station you can take the Line A Metro in direction Battistini. You need to take it for only 2 stops to Barberini. Exit the station following directions for exit Via Veneto. You will find yourself in Piazza Barberini at the bottom of Via Veneto. 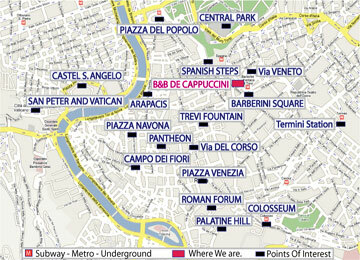 We are located the first left off of Via Veneto, Via Dei Cappuccini 30. Alternatively for a more panoramic journey you may take the bus 492 from the bus depot located outside the front of Termini which will drop you in Piazza Barberini. Should you wish to take private transfer from either airport there is a taxi rank located outside the arrivals hall but please establish your rate before getting into the car. As a guide line please note that for two people with luggage you should not be paying more than 55 euro to our bed and breakfast in central Rome. Private airport transfer can also be immediately booked on-line so that your personal car and driver is waiting for you in arrivals. There is also the possibility of taking the Terravision low cost coach which leaves approx 40 mins after every flight and brings you into Via Marsala near the Termini central station. The coach ride takes approx. 30 mins and do not hesitate to pre-book your single or return ticket online.For Ciampino a single costs 8 euro and a return ticket is priced at 13,50 euro and for Fiumicino a single costs 9.00 euro and a return 15.00 euro. In addition Fiumicino airport ONLY offers an express train from inside the airport which brings you directly into Termin train station in approx. 30 mins. From the arrivals hall follow directions for the FS. The first train in the morning is at 06:37 and the last train in the evening at 23:37 and trains run every 30 mins. Tickets are at the rate of 9.50 euro and can be purchased in the self service machines on the platform or at the nearby tobacco shop. Exit airport by following direction Roma. Take exit stated ‘Cristoforo Colombo – Roma Centro’. Continue straight ahead until you arriva at Piazza San Giovanni in Laterano, from there take Via Merulana until you arrive with Santa Maria Maggiore Basilica in front of you, take your second right up to Termini Station continuing past the station on your right hand side and over to Piazza Repubblica with the church Santa Maria degli Angeli on your right take the first right onto Via Cernaia, a left onto Via Palestro and a right through the arches of Piazzale di Porta Pia. From here you are outside the walls of the city. Take a left following the wall round on the Corso d’Italia until you arrive at Porta Pinciana, where it is recommended that you leave your card so as not to enter into the restricted zone. Walking through the arches down Via Veneto our bed and breakfast is the last on the right, Via dei Cappuccini, 30. Exit airport onto Via Appia (direction centro), take exit number 13 (Tiburtina, direction centro) follow all the way through until you find yourself in Piazzale del Verano. From here take Via C. De Lollis. When you see the arches coming up, pass them and take a right onto Viale Castro Pretorio. Go all the way up to the set of traffic lights taking a left onto Viale del Policlinico, here you are outside the walls of the city centre. Follow the Corso d’Italia round past Piazza Fiume and on until Porta Pinciana where we suggest that you leave the car so as not to enter into the restricted zone. Walking through the arches down Via Veneto our bed breakfast is the last on the right, Via dei Cappuccini, 30. On the motorway towards Rome take the Exit ‘Roma Nord’, you will be on the beltway (follow direction Napoli Tiburtina or Roma – Aquila). Take exit number 13 (Tiburtina, direction centro) find yourself in Piazzale del Verano. From here take Via C. De Lollis. When you see the arches coming up, pass them and take a right onto Viale Castro Pretorio. Go all the way up to the set of traffic lights taking a left onto Viale del Policlinico, here you are outside the walls of the city centre, follow the corso d’Italia round past Piazza Fiume and on until Porta Pinciana where we suggest that you leave the car so as not to enter into the restricted zone. Walking through the arches down Via Veneto our bed breakfast is the last on the right, Via dei Cappuccini,30. On the motorway towards Rome direction Fienze – Tiburtina). Take exit number 13 (Tiburtina, direction centro) find yourself in Piazzale del Verano. From here take Via C. De Lollis. When you see the arches coming up, pass them and take a right onto Viale Castro Pretorio. Go all the way up to the set of traffic lights taking a left onto Viale del Policlinico, here you are outside the walls of the city centre, follow the corso d’Italia round past Piazza Fiume and on until Porta Pinciana where we suggest that you leave the car so as not to enter into the restricted zone. Walking through the arches down Via Veneto our bed breakfast is the last on the right, Via dei Cappuccini,30.